Where should I have my Tampa wedding? Where should I have my Tampa wedding? We can help! We often get asked for suggestions on where in Tampa to have a wedding. 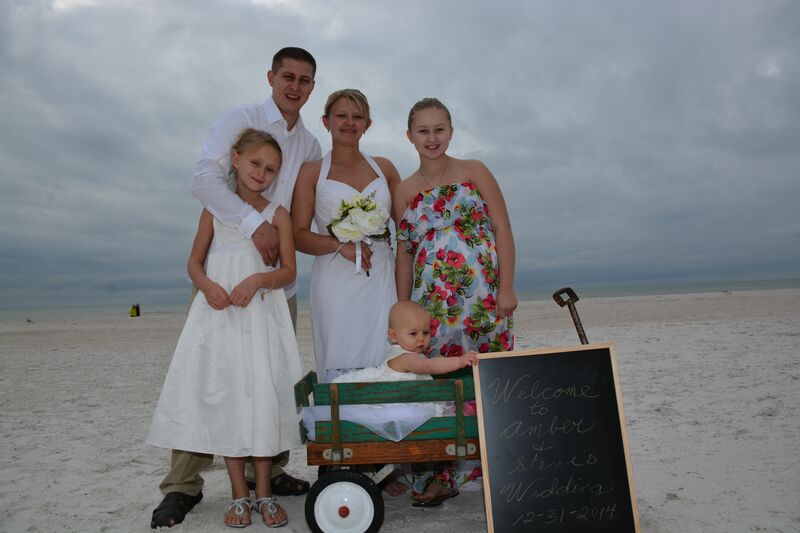 Recently, I got a call from a bride to-be who was in North Dakota and planning a Tampa Florida beach wedding. She had just been surfing the internet about locations and had contacted a resort in Marco Island. The resort told her to contact us, A Beautiful Wedding in Florida, for help answering her question on where to have her Tampa wedding ceremony. Barb contacted me and asked, where should I have my Tampa wedding? I guided her with suggestions and ideas for her wedding, places to stay ,and restaurant ideas for after the wedding. Barb’s wedding would consist of no more than 10 guests and she wanted it on the beach. She said she knew nothing about the Tampa area. As Barb and I spoke, we discussed options and ideas for her wedding. Barb decided she would have her wedding at Sand Key Park in Clearwater. Barb looked at our website, reviewed our packages, and a la carte items. Barb was so pleased and excited that we put together plans for just the wedding she had been envisioning. She decided on: Officiant, flowers, photographer, cake, and tiki torches. I helped her put it all together and she couldn’t have been more pleased. Barb emailed me two days later letting me know she got her flights and more of her family were interested in coming. She thanked me again and let me know how excited she was. I thanked her for contacted me and allowing us to be a part of her special day. 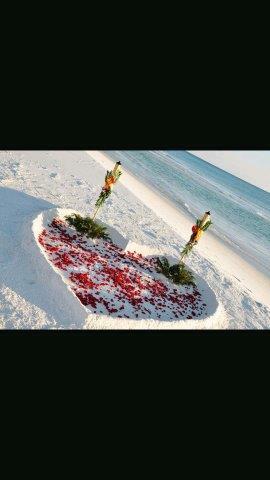 As Clearwater wedding officiant service this is what we do. We are always glad to give suggestions on locations for the wedding, fun things to do while you’re in the Tampa area, and we can always help with wedding ideas. Your Tampa wedding ceremony doesn’t have to be at the beach. If you’re not sure where in the Tampa area to have your wedding contact us, we’d be happy to recommend a number of park locations, gazebo’s, homes, and gardens. Steve contacted me about performing his wedding on Dec 31, 2014. He was traveling to Florida with his fiancé and their daughters from Illinois to visit family members in Ocala. While on vacation they wanted to get married. Steve wanted everything to be just right for their wedding. 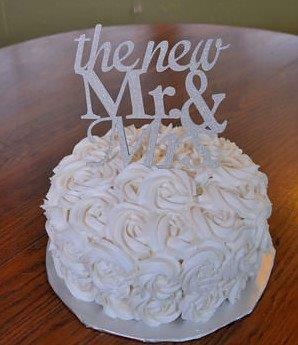 He had never been married and wanted to plan a nice wedding with family and a few friends. He inquired about our wedding packages and asked me if we had, “one of those things you stand under.” Hehe! Too funny! I asked him if he meant an arbor or an arch and he said “yeah, yeah that’s what I mean.” I directed him to our website and showed him the Clearwater Beach Specials that we offer. It sounded just like what he wanted. The arbor, photographer, and table and clothe for a sand ceremony. He had us add 10 folding chairs, a video, and music. 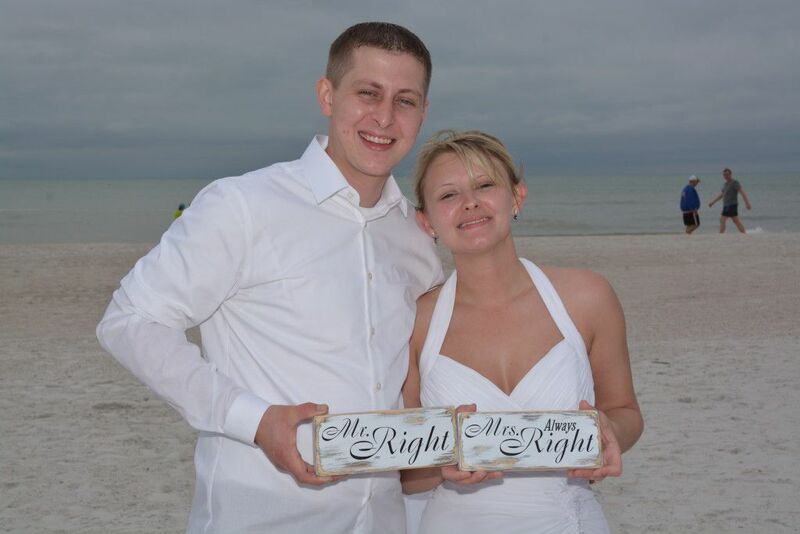 He was very excited about having put together the package and that I was able to accommodate him for his New Year’s Eve Day Clearwater Beach Wedding Ceremony. 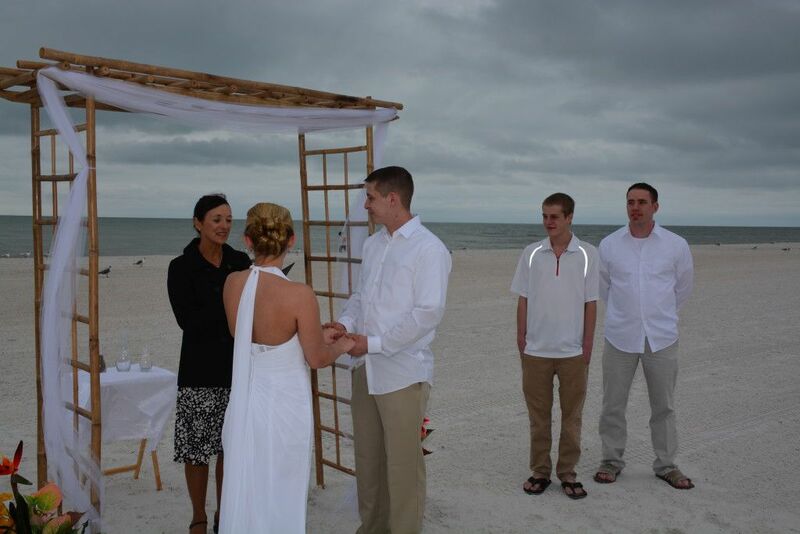 Me officiating Steve and Amber’s Clearwater Beach Wedding Ceremony. Photos by George Sr.
December 31 was a chilly day on Clearwater Beach. When Steve arrived he had some flowers to decorate the bottom of the arbor. 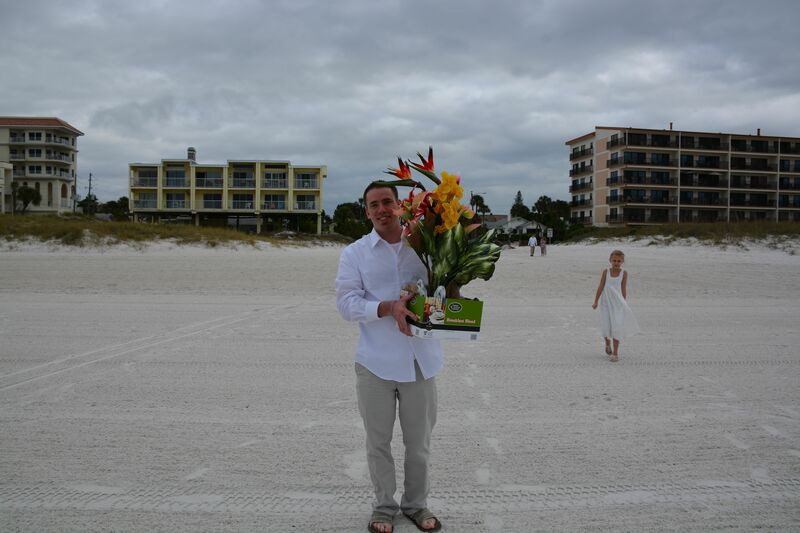 Steve getting ready for his Clearwater Beach Wedding Ceremony. Photos by George Sr.
Amber walked down the beach to the instrumental version of 1000 years . Their three daughters were in the wedding; the baby was pulled in a wagon. 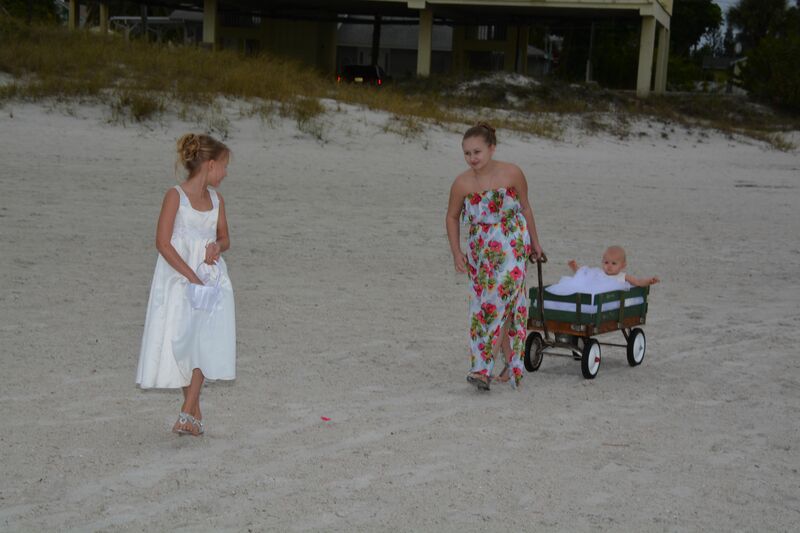 Baby being pulled in the wagon. Photos by George Sr.
George Sr. took photos and video for Steve & Amber. After the ceremony while George was taking photos I spoke to Steve’s Grandmother who was so happy for them. She told me that Steve & Amber had been together since they were 15 years old. They own a house, he is a hard worker, has a good job, and they have their three daughters. Steve had told his Grandmother that the only thing they were missing was marriage. She was so proud of him in putting together a beautiful Clearwater Beach Wedding Ceremony. It was something he really wanted to do. Amber held back tears as the vows were recited. They are a great couple and I had a wonderful family with them. 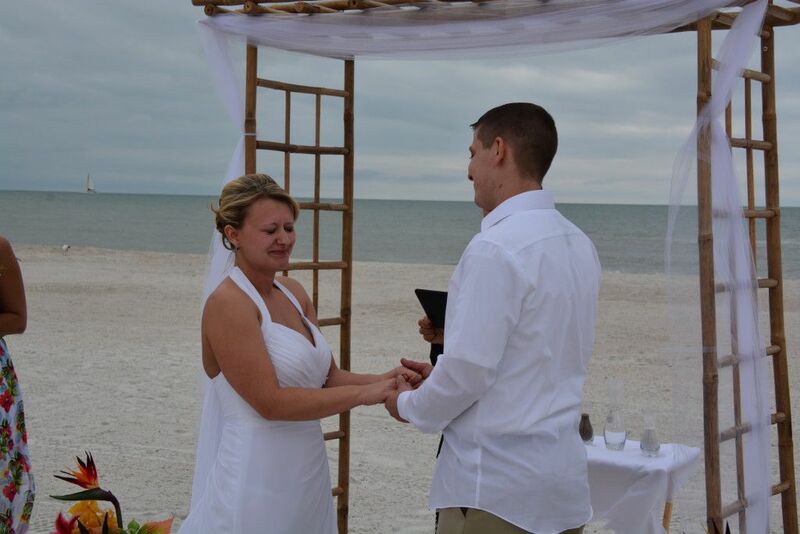 Amber holding back tears of joy during their Clearwater Beach Wedding Ceremony. Photos by George Sr. The newly married Steve and Amber. Photos by George Sr. They were so pleased and thankful. Steve said our service was beyond what he ever expected. They would be staying in Florida until the end of the week before heading back to cold Illinois.